What's that coin doing there? Capcom sent out a first look at the healing items in Resident Evil 7: biohazard to users part of its Resident Evil Ambassador program. 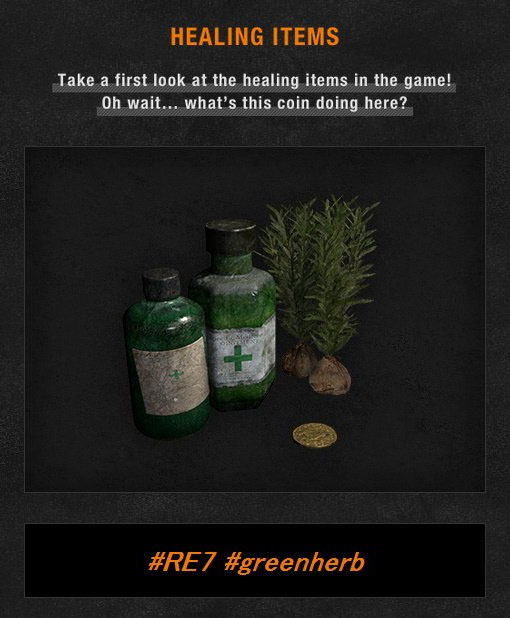 By the looks of it, the series’ traditional Herbs will make a return. There’s also a coin in the picture, for some reason. Resident Evil 7: biohazard is due out for PlayStation 4, Xbox One, and PC on January 24. The PlayStation 4 version will be fully playable in PlayStation VR.